Get Your Learner's Permit Today! Compare our various product packages and see which one is right for you! Save $3 NOW with coupon code "MOBILE"
Save $7.00. If you have never held a regular driver license in any state, country, or jurisdiction, you must complete a Traffic Law and Substance Abuse Education (TLSAE) course - also known as the Drug and Alcohol Course - before applying for a driving permit or drivers license in the state of Florida. This 4-hour online course is required for all new drivers applicants and is 100% online. Once you complete this TLSAE course, you can then take the Official Online Written DMV Test. Save $7.00. After you complete the 4-hour online drug and alcohol course and test, you can take the Official DMV Written Test for your Learner's Permit ONLINE! By taking the exam online, you don't have to stand in long lines for hours at a DMV office (see the "must watch" video). Your test consists of 50 road rules and road sign questions. You must be under 18 years old to take the exam online. Save $28.95. The Florida Drug and Alcohol Course and the Official DMV written exam may be done entirely online and is everything that the State of Florida requires before you can get your Learner's Permit. These courses may be purchased separately or bundled together to save money. If you purchase both at the same time, you can save $24.95. the Fast & Easy way to get your Florida Permit! The state approved Drug and Alcohol Course - 100% online. Start and Stop as much as you want. The DMV Test Prep Course - this course consists of unlimited learner's permit practice tests - similar to the test questions you'll see on the real test. Plus, you'll get the answers and detailed explanations. You'll pass the DMV exam the first time or your money back - 95% of students completing our Prep Course passed the 2016 online DMV exam the FIRST time! 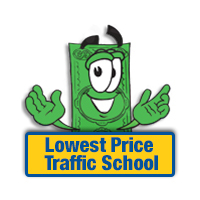 The Official DMV Online Written Test from the state's authorized provider - LowestPriceTrafficSchool.com. Don't stand in line for hours at the DMV - go online! The DMV Prep Course - a series of practice test questions, test answers, and detailed explanations. You'll pass the DMV exam the first time or your money back - 95% of students completing our Prep Course passed the 2016 online DMV exam the FIRST time! The Official DMV Online Written Exam for learner's permit applicants entirely online. Our Behind-the-Wheel online training course to help new drivers identify hazards and gain experience in a simulated environment. Our Driving Education Handbook for Parents to help parents instruct their first time driver.